Audi has produced some very good line up for the purchaser who is after a good make but not the one full of errors or discomforting experiences. It is a luxury brand with some very fine sedans which are with the company form the very start of its four-wheel vehicle production. But the SUV came very late in 2006. But this is not an excuse, there has to be perfection in this body style also but we can leave some space for mistake also as even a machine can err although the chances are low. This is a four-wheel drive and it does not necessarily account for being an off-road vehicle. It is true that the car can show some off-road capability but it is more inclined towards giving the right placing, excellent road grip and a comfortable drive. The interior is made according to the way it should be, practical and comfortable and above that spacious. This is a seven seats vehicle and the proportion is just right for the type. To add convenience for the owner there is Audi Q7 engines supply and fit service which can be availed if an engine change becomes inevitable. To start with the base engine is a 3.0-litre engine with a 215 bhp and timing of 7.3 seconds from 0-66 mph. The timing gives a good impression showing the ride would be a nice one. But with the same engine, there is a better version of 268 bhp. This one accelerates in 6.5 seconds form 0-62 mph. Spend a little more and has it instead of the lower one. This is smoother, gives more exciting moves in town and on the motorway. This has an eight-speed automatic transmission which works excellently for the car. The engine also does not mind accelerating hard and still remains comfortable. There is also a diesel-electric e-tron plug-in hybrid model which shows nice figures for emission and economy. If you want to go for the range-topper then head towards the mighty 4.0-litre twin-turbo diesel ready to give you timing of 4.9 seconds for the above distance. There are also Reconditioned Audi Q7 engines available so as to give you an easy replacement when needed. Audi is all about lush plush interior having updated technology and high-quality stylish materials and accessories used to highlight the inner environment. The seven seats all are usable. The third row however does create a problem if you try to get a tall person in it. But for a small height or children, it is good enough. The second row folds to give way for easy access to the rear seats. A simple push of a button and the third row vanishes as if not present at all, so if this one is not needed then you can easily increase the luggage area. The boot space despite all the rows in place is not bad at all of 295 litres. A power tailgate gives you easy entry to the area. For child safety, there are ISOFIX points in every seat making sure every occupier is safe inside. Audi has some very intelligent engineers, working with it always aiming for something exciting and impressive. They certainly aim for the rivals leading the class and they succeed in some aspects also. 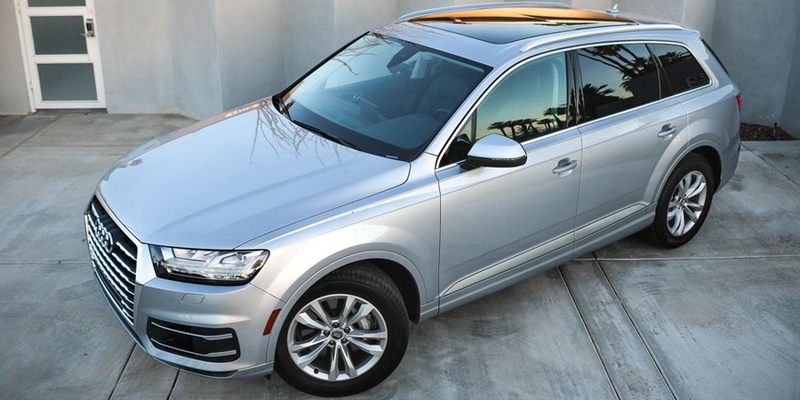 The comfort level of this Q7 SUV is no doubt superb. It provides the same amount of relaxation to the passenger as well as the one driving. The optional adaptive air-suspension if fitted further gives an edge to this aspect. The cabin remains vibration free with suspension absorbing disturbances from the road easily. Changing directions and placing the car in the right place it does not require any extra effort. The vehicle is as good as at higher speed as it is in the lower revs.